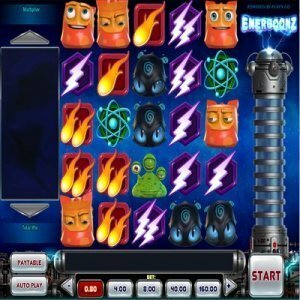 [miau] Energoonz Slot machine is a fun and cute game with unique graphics. The game opens up to a grid that features a cluster of alien heads that blink and blazes a burst of energy whenever the player makes a win (lining up three similar symbols). The symbols on the screen are very colorful and fun. The more wins made, the more symbols will take up your computer screen. The game was released in November 2013 and comes in the form of a 3D video slot. The jackpot amount for this game is $40,000! The game is hosted with 5 reels and 30 pay-lines. The slot volatility is low and comes with a coin range of .20 to 40. Players can enjoy free spins and multiplying drops along with up to 20 free spins and 5x multipliers. Whenever the player makes a win, the alien symbol will vaporize and be replaced with a wild symbol. Every time this is done, the player create more wins. With every win made, the player will receive a multiplier. The multiplier feature allows the user to earn more money with every win (sort of like a snowball effect). Players should note that it can take a while before seeing any earnings. This is also true for receiving free spins. The payouts are fairly small. Since the multiplier will allow the wins to increase with every win, the symbols usually have a low value. Most players will be able to achieve about 2x to 4x multipliers. Overall, the mobile slot is very interesting. Users will notice that they are able to clear most of the board, which is accompanied by hitting reels while gaining free spin rounds. The mood of the game changes when the alien icons turn from green to grey. In order to make the aliens “happy” again, the player must jolt a wave of electricity to bring them back to life. The background graphics of the game is smothered in a sea of navy blue and eye-popping icons. The color of the electricity bolts are purple. Energoonz slot machine also come with a plethora of in-game bonus features, such as semi-cascading reels. The reels often dip to create more wins. It is expected that the multiplier can go up at least 12 times. The wild symbol often appears once you make a winning combination. When the aliens vaporizes, a green mist is left behind. This is a fun low risk game that hosts a slew of unique features and colorful graphics.